Q 1. a) Will GST be charged on actual tariff or declared tariff for accommodation services? b) What will be the GST rate if cost goes up (more than declared tariff) owing to additional bed? c) Where will the declared tariff be published? d) Same room may have different room tariff at different times depending on season or flow of tourist as per dynamic pricing. Which rate to be used then? e) If Tariff Changes between booking and actual usage, which rate will be used? f) GST at what rate would be levied if an upgrade is provided to the customers as a lower rate? Ans. a) Declared or published Tariff is relevant only for determining of the the Tax Rate Slab. GST will be payable on actual amount charged (transaction value). b) GST Rate would be determined according to declared tariff for the room, and GST at the rate so determined would be levied on the entire amount charged from the customer. For example, if the declared tariff is Rs. 7000/- per unit per day but the amount charged from the customer on account of extra bed Rs. 8000/-. GST Shall be charged @ 18% on Rs. 8000/-. 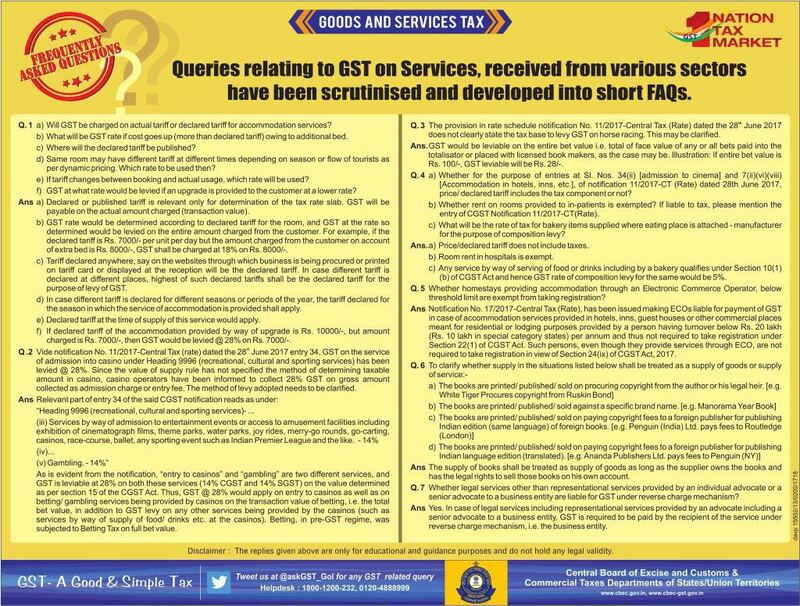 c) Tariff declared anywhere, say on the website through which business is being procured or printed on tariff card or displayed at the reception will be declared tariff. In case different tariff is declared at different places, highest of such declared tariff shall be the declared tariff for the purpose of levy of GST. d) In case of different tariff is declared for different seasons or periods of the year, the tariff declared for the season in which the service of accommodation is provided shall apply. e) Declared Tariff at the time of supply of the service would apply. f) If declared tariff of the accommodation provided by way of upgrade is Rs. 10000/-, but the amount charged is Rs. 7000/-, then GST would be levied @ 28% on Rs. 7000/-. (ii) Accommodation in hotels, inns, guest houses, clubs, campsites or other commercial places meant for residential or lodging purposes having declared tariff of a unit of accommodation of one thousand rupees and above but less than two thousand five hundred rupees per unit per day or equivalent. (vi) Accommodation in hotels, inns, guest houses, clubs, campsites or other commercial places meant for residential or lodging purposes having declared tariff of a unit of accommodation of two thousand five hundred rupees and above but less than seven thousand five hundred rupees per unit per day or equivalent. (viii) Accommodation in hotels including five star hotels, inns, guest houses, clubs, campsites or other commercial places meant for residential or lodging purposes having declared tariff of a unit of accommodation of seven thousand and five hundred rupees and above per unit per day or equivalent.